Yes, I can’t even walk into a Cost Plus World Market store without going straight to the candle section. Their candles aren’t the strongest on the block but boy are they pretty with unique and exotic fragrances. I simply can never resist. 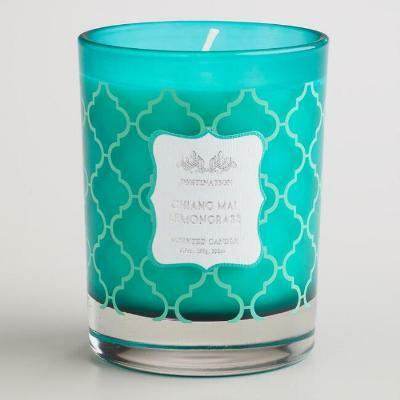 Chaing Mai Lemongrass was a really pretty candle with its frosted teal vessel and housed in a matching teal green box. It looked luxury but it wasn’t with a $10-dollar price tag. Can’t beat that. So I was not only drawn to this candle aesthetically, it also smelled amazing!! SOLD to the candle lover in aisle 8!! Reminiscent of an exotic vacation experience, our Lemongrass Chaing Mai Destinations Candle fills your space with hints of zesty lemongrass from a far off place. Perfect for the traveler, this serene candle soothes your senses as you relax. Great scent description. With my nose up to the wax, I smelled fresh lemongrass all the way with hints of something else I couldn’t pinpoint. Not really spice but something exotic. I loved it. Time to see how this candle performs. Cost Plus candles are generally very lightly scented for me so I stuck to a super small powder room to light this candle in. Once the wick was lit, it took roughly 30 minutes to reach a full melt pool and the aroma…. LOVED!! This candle was perfect in a small room and let me tell you, my entire bathroom and then some smelled like fresh lemongrass from the moment I lit the candle till I extinguished it each night. Lemongrass is one of my favorite scents to burn spring and summer and this candle really made me smile from ear to ear. It smelled like a true and fresh lemongrass. Loved it!! Strength – this candle was perfect in a small room. I wouldn’t even attempt in anything larger. In a small room, I would rate this candle an 8 out of 10. In a medium room, half that. Maybe 4 out of 10. This little Lemongrass candle really impressed the heck out of me. The last few candles I’ve purchased from World Market were kind of duds so this one pleasantly surprised me. With that said, I’ll definitely be going back for more next time I’m near one of their stores. 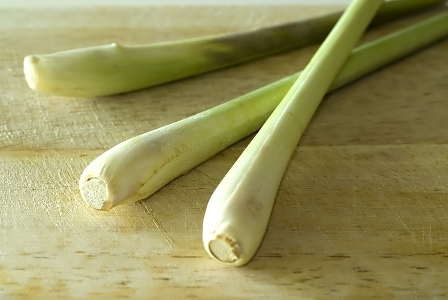 Love Lemongrass? Check out Chaing Mai Lemongrass next time you’re near a World Market store and sniff one… bet you end up taking one home. ?